Remember the Culver family: my great-great grandfather’s sister, Jenny DeKorn Culver, and her daughters, Lela and Rhea, who moved from Kalamazoo to Seattle 100 years ago. In the scrapbook which I received from a blog reader I found this photograph. Any ideas on the type of uniform? 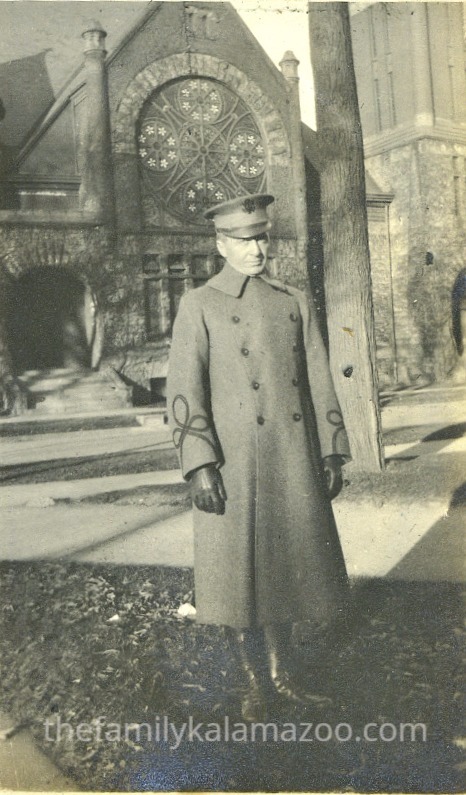 Since this would have been around the time of the end of WWI, does the uniform have to do with the war? I don’t know who the man is. Most of the Culver photos are of women. But the clues would leave me to believe the photo was taken in Seattle in or around 1918. But did Seattle have old elegant buildings like this at that time? What about the building? My first inclination was a church, but I don’t see any crosses. Are those rosettes for ornamentation? His birth and death dates are also engraved on the headstone. He died the day after the cornet solo, on June 19, 1911. He was 17 years old–not a man, but a boy! A photograph leans against the marblebase. He looks young and blond. The stone is further engraved with images and a poem. Although I have his dates, I can’t find Louis through Ancestry’s search function–or Find-a-Grave either. So I turned to Genealogy Bank where I found one article about his memorial service. 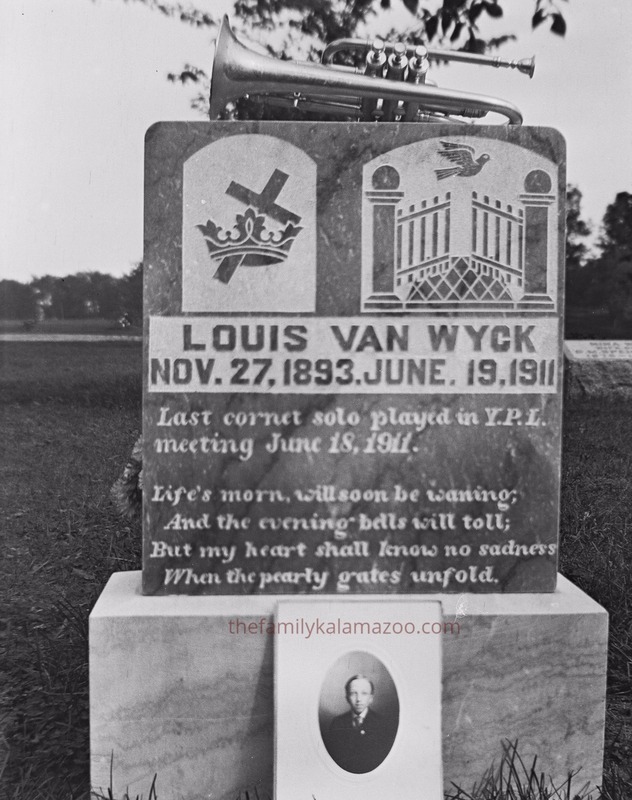 Read it here: Louis Van Wyck memorial service. Note that the passage about the funeral is at the VERY END of this article. I didn’t know what Y.P.L. on the headstone meant, but after reading about the Salvation Army hosting Louis’ memorial service, I looked it up online. It seems to mean Young People’s League. Now I have to admit I don’t know much of anything about the Salvation Army except that it is a Christian denomination and a charity, I sometimes donate furniture or clothing to them, and they (or volunteers like my family and friends) ring bells at Christmas outside shopping malls. I think Sarah in the musical Guys and Dolls belongs to a fictional representation of the Salvation Army. That is kind of fitting because I just read up a bit and discovered that music has been important to the Salvation Army from the beginning. How fitting this headstone was, then, for poor Louis. But how did he die at such a young age? And how was he connected with Joseph DeKorn or my family? He would have been about 12 years younger than Joseph. And why can’t I find him in documents in my initial search?